LignoForce™ in the News – NORAM Engineering and Constructors Ltd.
A recent article in Pulp & Paper Canada highlights the potential of the technology to lead the forest industry into new markets and higher-value product streams. 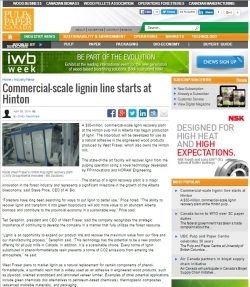 Lignin recovery is an attractive option for West Fraser’s Hinton Pulp operation in Alberta, given the company’s ability to use the bio-product as a direct substitute for phenol-formaldehyde-based adhesives in its engineered wood products. The unique attributes of lignin produced by the LignoForce™ process are the subject of ongoing development work into diverse, new applications being developed at FPInnovations, Alberta Innovates Technology Futures, and elsewhere.